A goat in the garden: Spring is in the air! Wow, the weather has been so nice lately, really spring like. 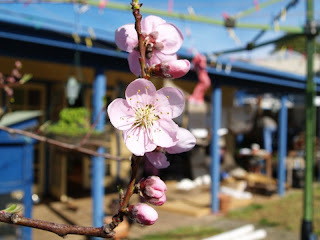 My beautiful peach tree is in full flower. This tree is one of the best things I have ever planted. I put it in about 5 years ago, and the last 2 years it has produced MASSES of peaches. Last christmas I got a Fowlers Vacola unit, and I bottled about a dozen bottles of these golden peaches. So yummy. My mouth is watering with anticipation of this years crop. Fingers crossed we don't get hail now (we always get hail when I have tiny baby peaches). There is nothing more rewarding than picking fruit and vegies from the plants that you planted and tended. So simple and yet so special. I love spring! Not much news regarding our little girl. She is enjoying life and the nice weather, spending alot of time in the great outdoors. Not walking yet, but she gets around and is happy. Tree planting is finally comming to an end. As much as I LOVE tree planting, I am always glad to see it over and done with for a few months. 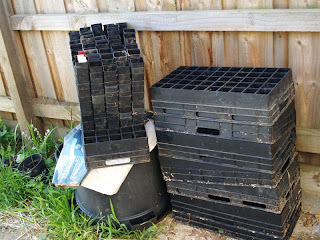 We have recently planted 8 blueberry bushes, and about 20 raspberry canes, as well as the last of the indigenous trees, here is a picture of the empty pots and trays - 400 in all, and yes its not a huge amount but it is when you have a young child, and a million other things to do as well. 400 means we don't spend several days planting for 8 hours straight, which I used to do as a job! We are also working out (well debating more like it!) how to plant the paddock trees. We are going to fence off some enclosures (I have found out through tears that no animal is compatible with small trees) for fruit and stock forage trees. These will also be shelter for animals, and also attract birds and insects to pollinate trees etc. We have been reading Masanobu Fukuoka's book about natural farming, so we have been inspired by this as well as permaculture principels. What we are working on though is exactly how we will fence the trees off, individual enclosures for trees, long narrow enclosures, large etc etc. We are also about to start concreting the hay shed, a big job for the 2 of us, but we should manage to get some help. Once that is done we will be able to get the shed walls cladded, and things will be moving along nicely. I don't think anyone will help with the concreting!